 Home  Cydia iOS 7  iPhone Unlock Sound  Unlock Sound  UnlockSound7  How To Enable iPhone Unlock Sound on IOS 7. Evad3rs jailbreak iOS 7 team has been released new evasi0n7 tool for jailbreak iOS 7.0.4 - 7.0 with new features. You can install it now from here. After jailbreak you can install a lots of cydia tweaks for iOS 7. We want tell you about one of them. If you have been a long time the iPhone user, then you may have noticed the lack of any sound when you unlocked your device after upgrading to iOS 7. If you miss unlock sound on your iPhone, we have good news for you. 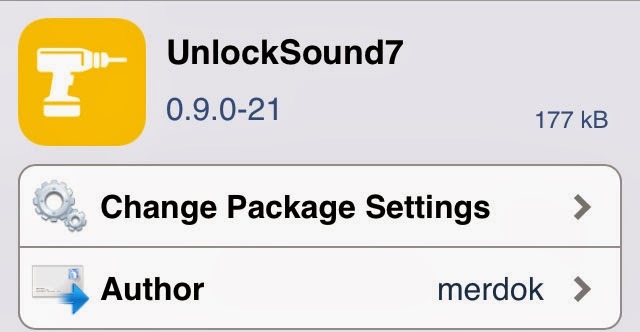 You can enable unlock sound on iOS 7 with new Cydia tweaks "UnlockSound7". This Cydia tweak brings the device unlock sound back. 2) Go To section "Search"
Do you want enable unlock sound on your iPhone?